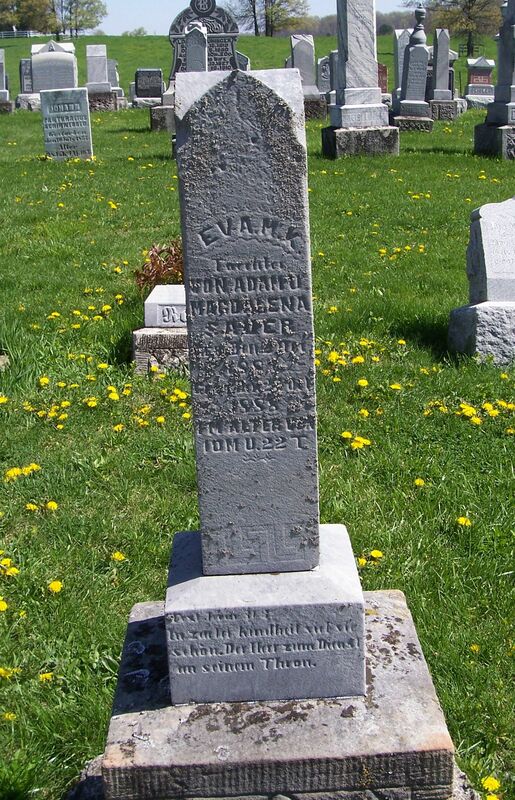 Eva M.K., daughter of Adam and Magdalena Sauer, born 2 December 1887, died 21 October 1888. Christened as Maria Eva Katharina, “Eva” Sauer was born in Willshire Township, Van Wert County, Ohio, on 2 December 1887, the daughter of Adam and Magdalena “Lena“ (Dietrich) Sauer. According to Zion Schumm’s records she was baptized at home on 18 December 1887 with Mrs. Maria Grund and Maria Buchner serving as her baptismal sponsors. Eva’s father Adam was born in Germany and 1900 census indicates that he immigrated in 1881. Her mother Lena was born in Ohio. Eva Sauer died of brain fever at home at 9:30 on the morning of 24 October 1888. She was only 10 months and 22 days old and was buried on 25 October. The church records give her funeral text as Jeremiah 31:3. Zion Schumm records the births and baptisms of four additional children born to Adam and Magdalena Sauer: Maria Anna Sauer, born 17 March 1885; Anna Katharina Sophia Sauer, born 15 June 1886; Heinrich Johannes Sauer, born 17 September 1889; and Adolph Reinhard Sauer, born 29 October 1891. Adam Sauer died in 1918  and his widow Lena (Dietrich) Sauer died in 1940. They are both buried in Concordia Lutheran Cemetery, Fort Wayne, Indiana. “Ohio, County Births, 1841-2003,” database with images, FamilySearch.org, Eva M Sauer, 2 Dec 1887; from Willshire Twp, Van Wert Co, Births, Vol.2, p.389, no. 85; FHL microfilm 1015856. 1900 U.S. Census, Willshire, Van Wert, Ohio, ED 98, p.12, dwelling 233, family 238, Adam Sauer; Ancestry.com. 1910 U.S. Census, Fort Wayne Ward 6, Allen, Indiana, ED 49, p.18A, dwelling 416, family 423, Adam Sauer; Ancestry.com. Find a Grave.com, Adam Sauer memorial no. 34635449. Find a Grave.com, Adam Sauer memorial no. 34635564.